Gobble Gobble Gobble. Many cooks stress over making the Thanksgiving turkey. I admit, I did too the first year I cooked a turkey and the entire Thanksgiving meal with out the assistance of some pre-cooked food. With a lot of research and minor tweaks, I created a turkey guide with a step-by-step process that makes it simple and stress free. Here I pass along my guide to you and guarantee that you will have your family’s mouth watering, like I did. 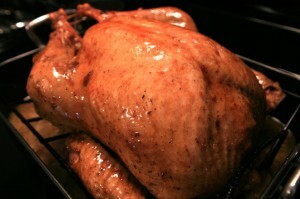 My amazingly juicy turkey recipe is a 6 step process. Follow these simple steps and you’ll be Queen of Bird. Bring water to a boil and add salt, brown sugar and cider. Allow to dissolve and add all remaining items. Pour liquid mix into a large cooler and add ice to drop the temperature – make sure the water is ice cold. Add thawed turkey to the cooler and make sure the turkey is completely covered. Add more ice and water if needed. Brine overnight, making sure that the liquid stays at an ice cold temperature. Remove turkey from cooler. Rinse away spices that may have stuck to the bird. Pat the turkey dry with paper towels. Mix olive oil with seasoning and rub all over the bird making sure to coat all parts evenly. Stuff the inside of the turkey with all the items above. Make zest using the peels that you removed from step # 3. Make sure to collect only the colored part of the peel as the white part is bitter. Use your index fingers to make a pocket between the skin and meat. Slide the zest under the skin. This will add lots of flavor to the meat. While stuffing the bird, preheat the oven to 350. Mix water and cider to combine and pour into roasting pan. Add onion and garlic into each corner of the pan. Place turkey in the pan. Tuck wings back under the bottom of the breast. Tie legs together with butcher’s twine. Roast in oven for 2 1/2 to 3 hours. Make sure the thickest part of the thigh reaches 165 degrees. 40 minutes before turkey is done, combine ingredients together in a sauce pan over medium heat. Summer until it reduces to 1/2 cup. Liberally baste turkey with glaze every 15 minutes until done.